CINCINNATI -- Cincinnati City Council members began to draw political battle lines this weekend over Mayor John Cranley’s efforts to push City Manager Harry Black out of his job. Cranley asked his hand-picked city manager to resign on Friday afternoon, said sources close to the two. This came just a day after Black forced the resignation of Assistant Cincinnati Police Chief David Bailey . In order to fire Black, the mayor needs the support of at least five members of council. It is unclear whether Cranley has the votes. Just two council members — P.G. Sittenfeld and Wendell Young — revealed their hand over the weekend: They stand with Black. “The positions of Police Chief and City Manager are difficult, complicated jobs; our current Chief and Manager do them well, and they have my support,” Sittenfeld tweeted. The positions of Police Chief and City Manager are difficult, complicated jobs; our current Chief and Manager do them well, and they have my support. Meanwhile, Councilman Young signed his name to a statement released Saturday from a contingent of the city’s most powerful African-American advocacy organizations, including the Cincinnati NAACP chapter, to support the city manager. Over the weekend, Cranley released a statement that he was out of town, and did not comment on the widespread media reporting that he had asked for the city manager's resignation. Black declined comment at a Saturday meeting on the city's neighborhoods. In a short statement, Cranley’s spokeswoman said he was out of town, but that he supported Police Chief Eliot Isaac. The other seven council members also stayed silent on Black over the weekend. Council members may begin to reveal their opinions as early as Monday. Council meets for the first full session on Wednesday. Last week, three city council members — Christopher Smitherman, David Mann and Chris Seelbach — publicly said they were unhappy with Black’s handling of the assistant police chief’s ousting; but none went as far to say that should be grounds for Black’s dismissal. The last time a high-level city leader was fired came in September 2015, when Black fired former Police Chief Jeffrey Blackwell. Although Black had the sole authority to fire the police chief, he still came armed with a scathing litany of accusations to persuade city council members, the mayor and the public that he was making the right decision, including that he took "selfies" along the funeral procession route of a slain officer. In a lengthy report issued on the day Blackwell was fired in 2015, the city manager released dozens of pages of emails and correspondence, including some by prominent African-Americans in the department documenting Blackwell’s shortcomings and mistreatment. It is unclear whether Cranley will use a similar strategy to win over public consensus -- and city council support -- that Black should be fired. Council members will likely face intense pressure from advocacy groups and voters in the coming days. Efforts to mobilize the city manager’s supporters have begun, and they could swarm City Hall on Wednesday to rally against the mayor’s efforts to force Black out of his job. 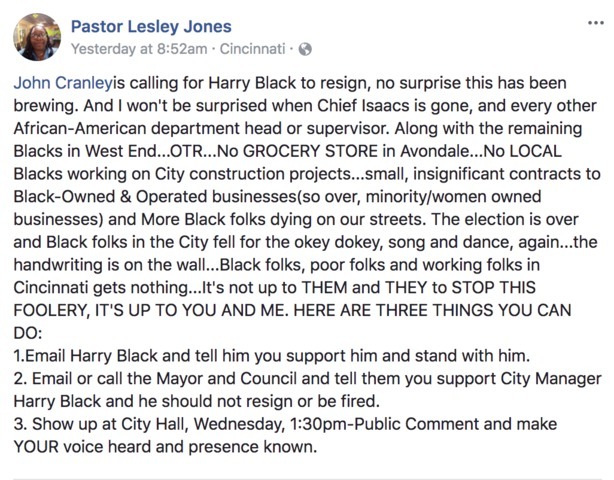 In a Facebook post, former Cincinnati City Council candidate Lesley Jones called for followers to flood Cranley’s inbox with emails and show up at council chambers Wednesday expressing support for Black. Former Cincinnati City Councilman Charlie Winburn, who left his post at the end of last year, also called on the mayor to work out an agreement for Black to stay in his job. In a Facebook post, the Sentinel Police Association, a 200-member group that represents Cincinnati’s minority police officers, encouraged followers to email and call council members directly on the issue. The Sentinels have offered support for Black and his handling of personnel problems within the police department. City Council meets 2 p.m. Wednesday at 801 Plum St. Public comment is set to begin at 1:30 p.m.